First of all, let’s debunk the myth that Oscar always gets it wrong. Of course there are wild differences of opinion out there over what is the Best Film™ of any given year. Plenty of people (though not me) think The Hurt Locker was wildly over-rated and something else (Avatar – really?) should have won. But that’s not what we are talking about here. The decisions that could have gone either way and which we feel personally affronted by are for discussing another day, here and now we need to consider the solid gold-plated screw ups – the decisions that surely no-one could defend as right but which somehow got made. For the record, there are probably more than six, but here are half a dozen films which are absolutely right to feel (do films have feelings?) hard done by. This and the immediately following entry represent the harshest one-two punch in the Academy’s long history. After spending the 1970’s churning out solid gold, Martin Scorsese delivered what many, myself included, would consider his greatest film. Raging Bull tells the story of Jake La Motta, a phenomenally talented but deeply troubled boxer, across many years of his life from success in the ring to bloated appearances on stage as a raconteur. In many ways it is an archetypal tale – a violent man whose inability to control his inner demons costs him success and stability in life as he systematically abuses and pushes away anyone who might otherwise want to help, love and support him. 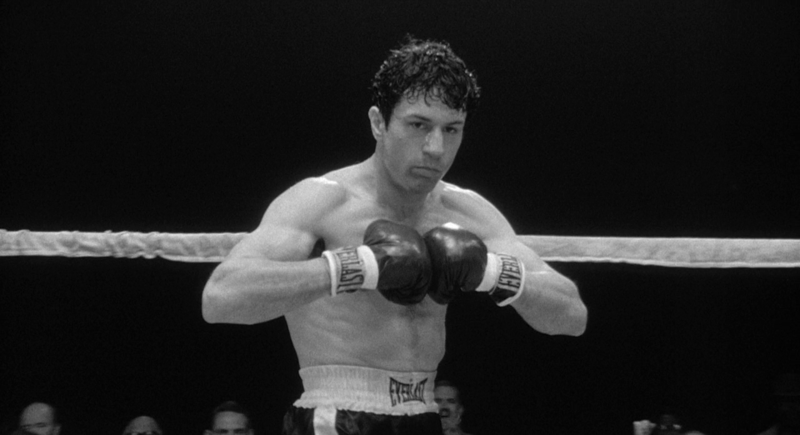 Shot in stark but affecting black and white, with some of the most visceral boxing scenes ever committed to the screen, Raging Bull represents the high point of not only Scorsese’s output, but also that of pretty much everyone else involved. Of course De Niro would go on to be deeply impressive in King of Comedy, Goodfellas, Casino and Heat, but he is perfect and matchless here. After being overlooked throughout the 1970’s, Scorsese must have hoped that after De Niro picked up a golden baldie for playing La Motta the writing was on the wall for his work as a director. Alas it was not to be. Debutant director Robert Redford had his Ordinary People in the mix and although it is a very good film, with shades of Good Will Hunting in its scenes of therapy for a troubled young man, it cannot hold a candle to Raging Bull’s emotional impact, technical accomplishments and overall quality. As we well know, it would be the best part of a quarter of a century before Scorsese would finally be properly recognised by the Academy and they missed several opportunities to reward him on the way there. But this was their most egregious mistake. Previous articleKristen Wiig and Seth Rogen to Guest Star in Arrested Development Season 4! US Election Special: Which Movie President would you vote for?